Unit 2 is based on the understanding that the Built Environment emerges over time and is in a constant state of transformation. In unit 2, the students will become aware of distinct decision-making levels in the built environment. Unit 2 promotes the idea that the built environment is a social as well as a physical ecosystem. As can be seen from the image we have use for this evening, symbols iconic to Open Building thinking – first used by Habraken to explain the relationship between the individual and the collective and how to achieve a state of balance between the two through the interface of building and technology. By the time the students have finished this unit, their thinking about the built environment will have been completely transformed. These concepts will be studied at all built environment levels – from high level policy level to project level innovations. Open Building is about openness, transparency, democracy, equity, balance – values that resonate with present day South African concerns. Unit 2 will promote an OTHER way of thinking about the built environment and and OPEN way of engagement, designing and making. Open Buildings are able to offer architectural infrastructure of sustained architectural quality, as well as spatial and technical capacity. This unit links strongly with international trends in thinking about the built environment. 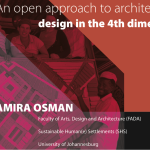 One of the aims of this Unit is to demonstrate that Open Building is also highly relevant to South Africa – and that South Africa can be the pioneer for Open Building and innovative approaches to human settlements in developing countries and beyond. Open Building allows for diverse interpretations of concepts that are not confined to any particular building type or product. Unit 2 will explore the boundaries between architecture & planning, building & city and architecture & infrastructure towards a new way of designing and building in the interest of of spatial equity, access to opportunity, efficiency in design, finance, management, maintenance and implementation. Unit 2 has a strong design and technology focus. Indeed, we suspect that the most innovative projects to emerge from the unit system, will be the ones that explore the interface between the three units. I am looking forward to great synergies to happen that will shape the future identity of the school. © UJ Unit2 2016. All Rights Reserved.